My mom shared this recipe with me 3 years ago but I still think it’s not quite the same as the one we have in Quezon City. Either way, this has worked well for us here in New York. Enjoy! The use of Coconut Vinegar is highly recommended. Philippine brands like Datu Puti work best. Put pork belly and chicken in a large casserole dish. Sprinkle garlic over pork and chicken. Combine vinegar, soy sauce and water and pour into casserole Do not use an aluminum casserole dish as the aluminum will react to the vinegar. Bring to boil without stirring. Whe mixture boils, lower heat to simmer and add bay leaf, if using. Add salt and allow to simmer until meats are tender about 30 mins. Remove chicken first (first to tender), then pork, reserving ay liquid. In a wok, heat oil and brown the pork and chicken in batches. 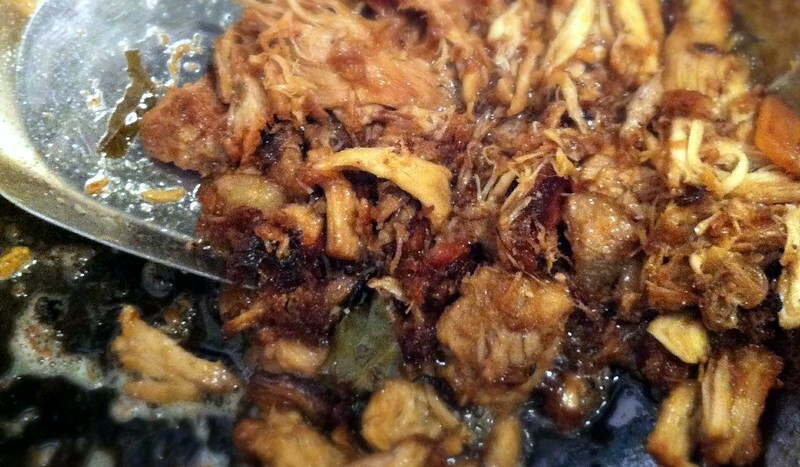 Remover from oil as pork and chicken browns and arrange in a serving dish. Blend together reserve liquid. Pour over chicken and pork. Serve with hot rice and chopped tomatoes.